Strength represents the tremendous power that comes from gentleness and focus. The image on the card depicts a woman riding a wild horse she has tamed. She has tamed the wild beast through tenderness and intuitive grace. Strength remains calm and patient in emotionally charged situations. She has the stamina to overcome obstacles and challenges with compassion and tolerance. Strength moves beyond the impulse to respond with angry or fearful emotions. 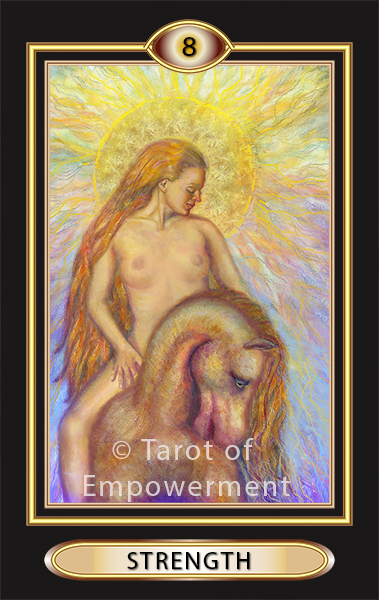 In Tarot of Empowerment, Strength has not only tamed the horse, she has also made it her ally and companion. The sun behind Strength represents vitality and optimism. Her horse represents life energy and drive and is serene as it carries her forward with elegance on her journey. She rides gently, with compassion and control in the nakedness of her truth. Upright: When the Strength card comes up in a reading, you are called upon to transcend your emotions and stand firmly with self-control. Trust that you have the internal power and fortitude to endure and conquer the challenges that may rise up before you. True Strength relies on gentleness and focus, not the use of force. Strength gives you confidence to meet internal or worldly impediments with grace, unencumbered by emotional reactions. Empowerment: You are empowered to meet challenges with the self-assurance and calm that disarms those with whom you may find yourself engaged in a conflict. Reversed: When this card is reversed is suggests that you call on your inner Strength, remembering to be gentle and kind to yourself. As a block, the reversed Strength card would mean that you are likely feeling powerless and inclined to react from anger or fear. Identifying blocks empowers you to discover tools to dissolve them. Sometimes, just the awareness that you are blocked is enough to change your reaction, hence, the energy around the block. Numerology: Strength is the number 8 which is about power. The other card that reduces to an 8 in Tarot is the Star (17).